I love the clean look of the Whisper White craft ink against the dark coloured card stock. My twelve-year-old son remarked that the inked edges reminded him of snow - he takes a keen interest in Stampin' Up and often gives me words of encouragement! The cards were very simple - even for me! - so I attached everything with dimensionals for added interest. Cut a 7.5cm square piece of Not Quite Navy card stock. Using Whisper White craft ink stamp a snowflake on it and add a sentiment below it. Sponge the edges of the card stock with the ink. Stamp another snowflake on a scrap of of Not Quite Navy card stock and punch out the centre with a 1" circle punch. 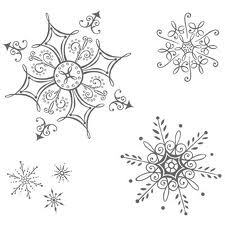 Fix this on top of the first snowflake with a dimensional and add a large rhinestone to the centre. Attach the panel to a 9cm square Crumb Cake card blank. ... and here it is in Cherry Cobbler. There's an almost Shaker feel to these cards which I like. Oh these are lovely Vicky! I was trying to decide whether to buy the whisper white ink, and after seeing your samples it now on my order... thanks! Oh this is just about the most beautiful christmas card ever!! ...and to think it is quick too!! It is absolutely gorgeous Vicky especially the blue one- I'll be buying this set if it ever comes to Oz! TFS! These are gorgeous! Off to try that set with Whisper White ink now, thanks for the inspiration. Wow, three minutes? I don't think I could make those that quickly! You are fabulous, Vicky! I like how you inked the edges of the colored panels in white. It adds an aged and frosty feel. Very nice. I really like this set - the snowflakes are so pretty. And your trio of cards is just beautiful!! Love the colours too. Such a great idea to punch and pop up the middle of the snowflake for added interest. Love that idea! I'm especially loving the blue one.